The bag you'll see in this post is special. Not because it’s a first full-leather bag I’ve shown here (somehow I only show fabric-leather combo bags :D), but because it’s my first sewn handbag. What an ambition for a beginner, right? When I started making this bag, I knew nothing about handbag sewing. Everything started with an idea. 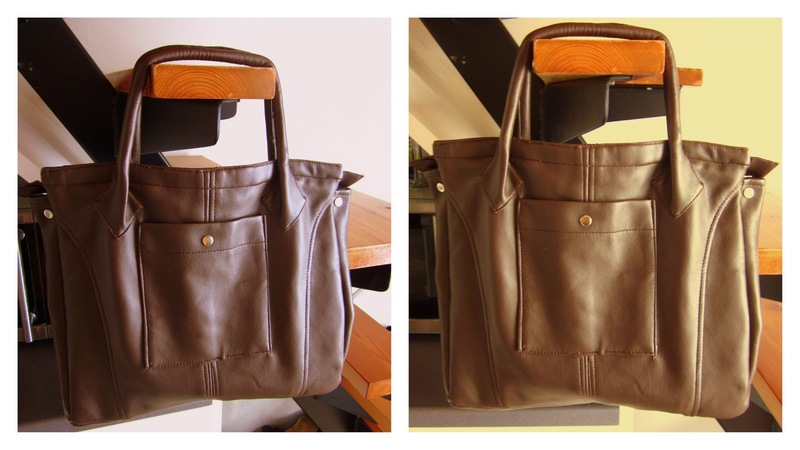 An idea to make a leather bag. After a week of thinking, I went to the thrift store, bought the cheapest decent looking faux-leather jacket I could find, cut it and sewn pieces together. I didn’t use a pattern – just drew a couple of squares on a piece of paper and cut them out. To be honest, I only used it once. I thought it was so far from perfection, that I hid it somewhere in the closet. And it would have stayed there if not for my friend – I showed it to her one day and she seemed to really like it! Her kind words inspired me not to stop after one bag, but to continue making them (if she is reading this, I’d like to say: thanks dear ;) . If you’re thinking about making a handbag, I have just one tip for you (though it’s different than tips you might find somewhere else). So here it is: make a bag you really want to make. I know that if you’re thinking of making a handbag, you already have a picture in your head how it should look like. Go for it. Don’t make the easiest bag you can find just because it’s easy – it won’t inspire you. Make the bag you really want to make –you will be happy making it and you will learn a lot. This is so amazing (and brave) of you! I've been wanting to try and make a bag for sometime and just have been too nervous to try. You're right about "making the bag you want to make" - just the motivation I need! Love your bags!